A concentrated blend of grease cutters and emulsifiers. 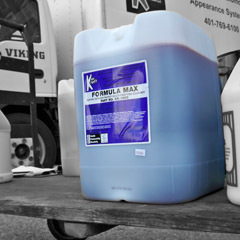 Moderately foaming, low caustic, and contains corrosion inhibitors. Excellent for fabric and upholstery cleaning. Engineered for use via the Kar Kraft Kem Kontrol Unit.